A mixed set that turned out a bit electronic. The sound - at least in headphones - is deep, dark and synthetic. The highlight for me are the Bierbeben and Clara Hill. Germany leads the way. Markus - a deep (house) sound. Unexpected, but well done. The whole album is rather good. Clara - not quite as easygoing as the previous album. Darker, heavier. Nice touch with the many collaborations, even if it easy to get an overdose of Duplaix, Britt and friends sometimes. The Slope collaboration feels fresh. Aquarius - latin rules. Especially these old classics. Some day I'm going to make a compilation only with latin classic covers. Jaxx - more of the typical Jaxx sound. It doesn't work that well for me anymore, not a full album anyways. A single or two is still fine. The energy is always high with the Jaxx. Outkast - quality music but not my cup normally. There are a couple of highlighs on the album. These two tracks are nice because they are a little different. Ryuichi - nice remix. Spacy. Nice sample. Sumo - a follow-up from last month's new Swedish music exhibition. Bierbeben - maybe I'm sick, but I get happy when I hear this kind of music - the lyrics and the band profile isn't exactly "happy" so I don't understand why. I'm bad. MP3 sound bite (3.1MB). 20 seconds from each song. 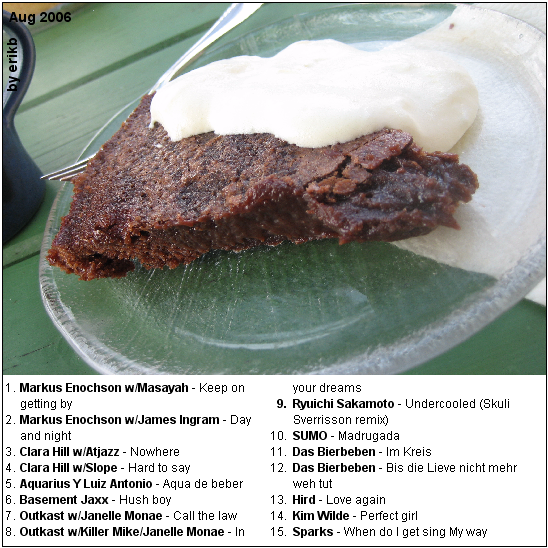 Cover shot: mud pie. 7/10 points. Content updated 10 March 2019. <URL: http://www.boralv.se/blog/?id=1159028861>.